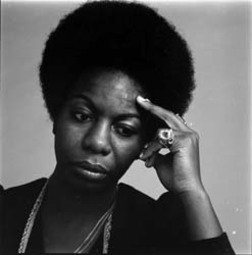 The first Nina Simone song I heard was “4 Women,” a hypnotic ballad that is a character study of Black American women throughout the generations, from slavery to the Black Power Movement. The lyrics were powerful, but the Voice–a rich, mournful contralto–was haunting. It was (and still is) one of those voices that could sing the phonebook and I’d still listen. The album was from my father’s vinyl collection–long since sold. (The collection was extensive–with many vintage and first edition jazz albums). I found out that my mother knew Nina as a child; they grew up in the same town and Mom knew her by her birthname–Eunice Waymon. Simone has been dubbed the High Priestess of Soul. But soul music was only part of her repertoire. In addition to her own material, she sang jazz standards, Bretchian showtunes, and Dylan. She was also an accomplished piano player. The ‘high priestess’ tag was correct–there is something supernatural about her performances, both live and recorded. One of my (as yet unpublished) pieces, “Coalrose,” is based upon her.